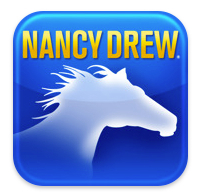 Thanks to this review from Common Sense Media I recently downloaded the iPhone version of the Nancy Drew: Shadow Ranch app from Her Interactive for our 10 year old daughter (There’s an iPad version). She LOVED it! For several days she wanted to use my phone while we were out to continue reading and solving the mystery. We usually take a book with us everywhere; this gave us an interactive book in my pocket. Plus, I felt much better about her spending time with this app than I do when she plays Diner Dash or some other pedicure design game she found. One warning, she was using it in the car and it includes sound effects. Out of nowhere came a loud shriek and my husband and I both thought we’d truly run over a cat. Turns out it was a horse neighing. So the sound went off. It reminds me of the old “Choose Your Own Adventure” books I used to love. Now that she finished it once, she can create a new user for herself and do it again taking different paths. She’s now eagerly waiting for the next one. I knew THAT wasn’t good advice. While I give some tips in my original post, I decided it was time to go to the experts for more advice for my readers. So I reached out to my friend Carol Fishman Cohen at iRelaunch. iRelaunch offers a range of resources and services for women re-entering the workforce. All of which are informed by Carol and her co-founder Vivian’s constant interaction with employers and recruiters, plus their own experience as hiring managers and recruiters. Carol packed our conversation with advice worth its weight in gold, for mothers and for anyone with a gap in their resume. FREE Teleparty for Mothers Starts 4/27! Sometimes the universe conspires in your favor and takes its time doing so. As my book was coming out over a year ago, my friend Beverly Schoff Belling, a life and creativity coach (Creativity on the Loose) connected me with Patty Lennon, a life coach and mother. Bev and Patty met as part of a Martha Beck coaching series and when Bev posted to Facebook about my book, apparently Patty “went nuts over it! !” Patty and I traded emails but weren’t able to meet in person on my book tour to the east coast back then. But we reconnected recently when she reached out to me to be part of the launch of her new online community Mom Gets a Life. Beginning April 27 Life Design Coach and Mom Advocate Patty Lennon will be hosting a 3 week teleparty* for mothers. I’m thrilled to be the very first guest in this upcoming FREE event just for mothers. Download "Tales from the Revolution"
My friend Beverly Schoff Belling over at Creativity on the Loose submitted a story about me and the impact of my work with mothers and my book, This Is Not How I Thought It Would Be: Remodeling Motherhood to Get the Lives We Want Today, to Amazon’s The Domino Project. Hope you’ll download it to your phone, Mac or Kindle. It’s a great collection of stories to inspire you to take action on whatever you care about! Book Review: “Good Enough is The New Perfect” is Out Today! “Good Enough is the New Perfect” by Becky Beaupre Gillespie and Hollee Schwartz Temple hits bookstores today! I’m happy to be featured in the book along with so many other experts like Cali Yost and Ellen Galinsky and so many amazing mothers! Order your copy now and for more information visit The New Perfect website. In “Creating a Family Vision” I described how my husband, daughter and I spent part of our vacation in January creating vision board collages. We each thought about the day of our daughter’s high school graduation and then collected magazine images that reflected our feelings and dreams for our family. As promised, here’s what we did next. After we’d shared our vision board collages, we ate dinner and then returned to the magazine-covered floor to continue creating a family vision. “We are…” is what makes our family unique. “We believe…” is what we believe in and value. “We want…” is what we want for our family over the next 8 years. “So let’s start with ‘We are…’ What makes us unique?” I asked. As a Happy New Year gift, I wanted to share 5 of my favorite things I discovered in 2010 – along with one RE-discovery. Hope you’ll share yours too! Looking for a Father’s Day gift? My husband and I both recommend Home Game: An Accidental Guide to Fatherhood by Michael Lewis – author of The Blind Side and most recently The Big Short: Inside the Doomsday Machine. I’m so glad my friends Amy and Marc Vachon over at Equally Shared Parenting flagged on their blog that there’s a new documentary coming out for Father’s Day this year, The Evolution of Dad, by Dana Glazer. I’ve been watching his site and clips evolve for awhile now. In fact, in my book, This is Not How I Thought It Would Be: Remodeling Motherhood to Get the Lives We Want Today, I quote his interview with sociologist Michael Kimmel. Video is such a powerful medium for busting stereotypes and I can’t wait to see Dana’s final product. Check out the trailer now.